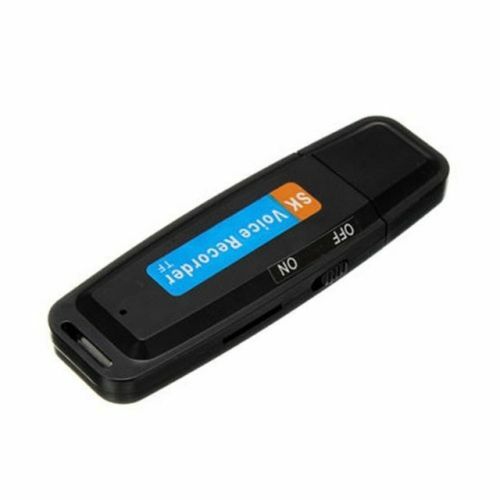 Effectively record any conversation with this small, portable USB Voice Recorder! This amazing little gadget looks just like any other USB drive. However, there's a staunch difference...this USB drive is actually a voice recorder! The microphone is so tiny, nobody will EVER see it. Place this voice recorder virtually anywhere. You can put it on your table, on your desk, next to your bed...ANYWHERE! It is designed to pick up sounds from 20 feet away. Place it in your pocket or your purse and you'll still get a crystal clear sound. There is a small switch on the side of the USB drive that you flip to begin voice recording. Once your done, flip the switch again to stop recording. When you want to hear a playback of the recording, simply plug the USB drive into your computer. You'll see a folder automatically open on your screen. Your recorded conversations will be inside of the folder. Each and every time you turn the power on, a new file is made. When you turn the power off, that particular audio file is saved. This allows you to easily separate conversations with multiple people. The drive can store up to 144 hours of audio. Never worry about running out of recording space.